​​​​​​ SUGAR LAND – Imperial Market developers are gearing up to start construction March 1, 2018, transforming the historic old sugar refinery site in Sugar Land. On the 26 acres overseen by developers Geoffrey Jones and James Murnane, the Imperial Sugar building will be transformed into a mixed-use destination complete with dining, shopping and lodging options. Historically significant landmarks on the property include the Char House—​which will be turned into a boutique hotel—as well as an engineering building, three-bay warehouse, container warehouse, silos and smokestacks. The bottom portion of each of the three silos, which are about 2,000 sf each, will be restored to house restaurants. Of the 26 acres Jones and Murnane are working with, four​ acres were sold to Sueba Construction for the development of a premier multifamily community. 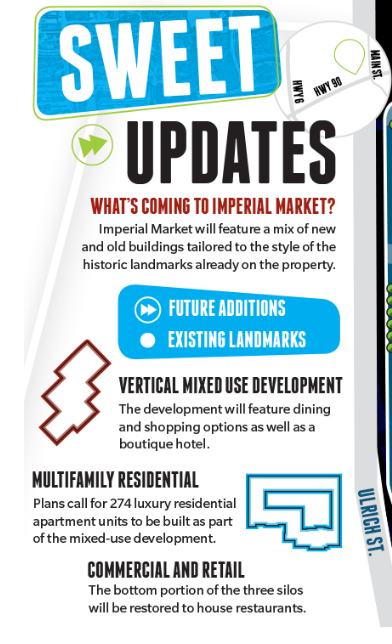 Imperial Market construction is estimated to be complete by fall 2019.